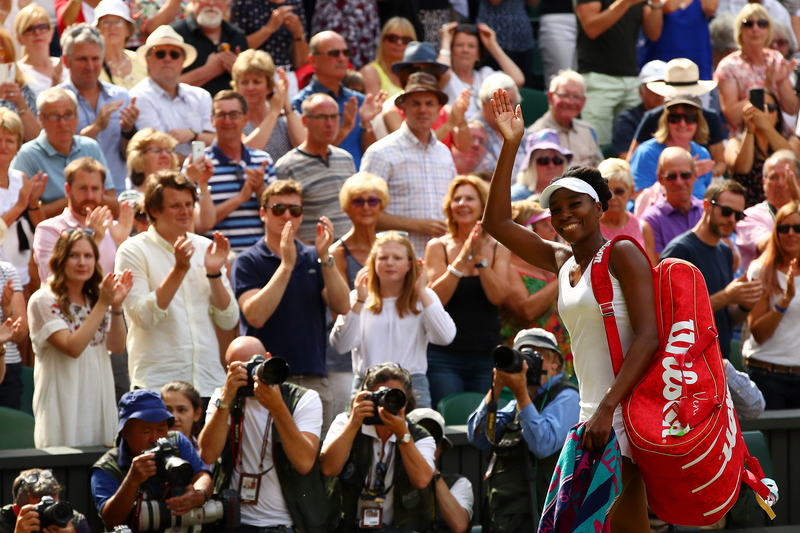 With every ace and every unforced error, Venus Williams, 37, was battling more than just her 26-year-old opponent, Johanna Konta, at the Wimbledon semifinals. The five-time singles champion is fighting Mother Time and all her creaky henchmen: Lost a Step, Feeling Broke Down, Used to be Cute and Getting Too Old. With the first set on the line, Konta fought off the first of three break points, but Williams had been here many, many times before. In tennis and life, that matters. Advantage Williams. She won the first set 6-4, and fans around the world cheered. Many of us are not just rooting for Williams. We are rooting for ourselves, heading into the back 40 of our lives. Williams is the oldest women’s player to reach the semifinals since Martina Navratilova in 1994 and is playing her best tennis in years. At the Australian Open in January, she advanced to her first Grand Slam final since Wimbledon 2009, losing only to her sister, the incomparable Serena. It has been 20 years since her first Grand Slam final at the 1997 U.S. Open. To get to Centre Court at Wimbledon on Saturday, she beat five teenagers and 20-somethings, not to mention injury and illness, including a 2011 diagnosis of the autoimmune disease Sjögren’s syndrome. Williams’ success as her career as a world-class athlete inevitably starts to wind down marks a goal for the rest of us to aspire to: the ability, as we get older, as life comes at us fast, to stay in the game. 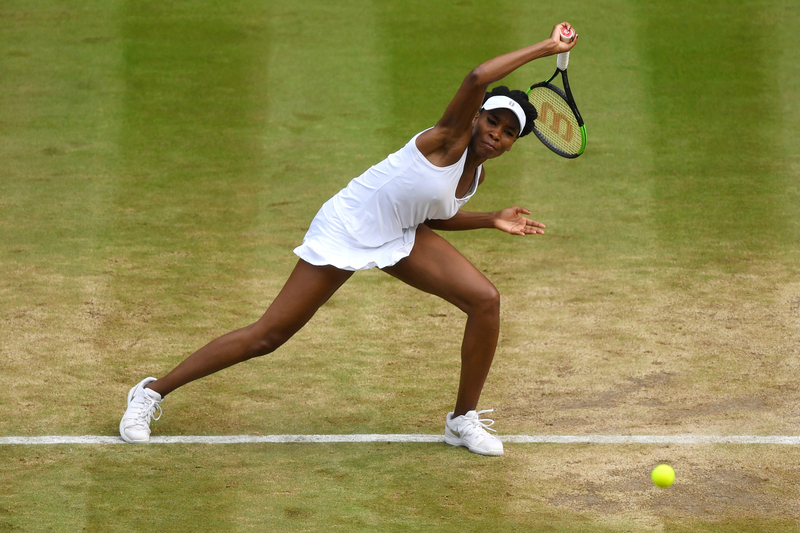 Venus Williams plays a forehand during her ladies’ singles semifinal match against Johanna Konta of Great Britain on Day 10 of the Wimbledon Lawn Tennis Championships at the All England Lawn Tennis and Croquet Club on July 13 in London. Williams won 6-4, 6-2. As Satchel Paige, who made his major league baseball debut at 42, once famously said, “How old would you be if you didn’t know how old you was?” Or perhaps you’re hearing Aerosmith’s classic rock dinosaur, “Dream On”: Every time I look in the mirror / All these lines in my face getting clearer. Go ahead and dream on. But work on your hips and knees, and keep that backfield in motion so that you can still show off that fierce Wobble at the office Christmas party. There’s wide variability in peak human physicality. Tennis players may peak physiologically in their late 20s. But because it is a noncontact sport, tennis is better suited to longevity than are sports such as football and basketball. Venus Williams acknowledges the crowd as she celebrates her 6-4, 6-2 semifinal victory over Johanna Konta at Wimbledon on July 13. Ritchie said that includes spending at least three days a week in some form of physical exercise. It doesn’t have to be in a gym. It can be hiking or swimming or dancing. Just keep it moving. Doing air volleys while cheering on Venus Williams counts. It’s when you stop moving (perhaps because something starts to twinge) that muscle atrophies. During Thursday’s semifinal match, analyst and former tennis superstar Chrissie Evert marveled at how Venus was “in the zone right now. She’s playing perfect tennis.” On Saturday, she’ll face 23-year-old Garbine Muguruza of Spain. If she wins, Williams would become the oldest woman to win a Grand Slam singles title in the Open era.